Step 1 Line a shallow roasting pan with foil, extending a few inches beyond the edge of the pan. Step 2 Place the roast in the pan. Combine the pureed chipotle, sugar, oil, cumin, salt and vinegar. Brush the mixture over the surface of the pork. Let rest at room temperature for 1 hour. Step 3Heat the oven to 350 degrees. Roast the pork uncovered for 1 hour. After 1 hour, pull the foil lining around the roast to prevent it from drying out. It's OK if it's not airtight. Roast until an instant read thermometer inserted in the center of the pork registers about 180 degrees, about 15 minutes. Pour off the pan juices in the foil into a small bowl; skim and reserve them for the ketchup. Cool the pork, still wrapped in foil, on a rack. When cool, refrigerate overnight or as long as 2 days. To serve, cut the pork into thin slices, stack, wrap in foil and warm in a 250-degree oven for 18 to 20 minutes. Wrap the rolls in foil and warm them in the oven with the pork. 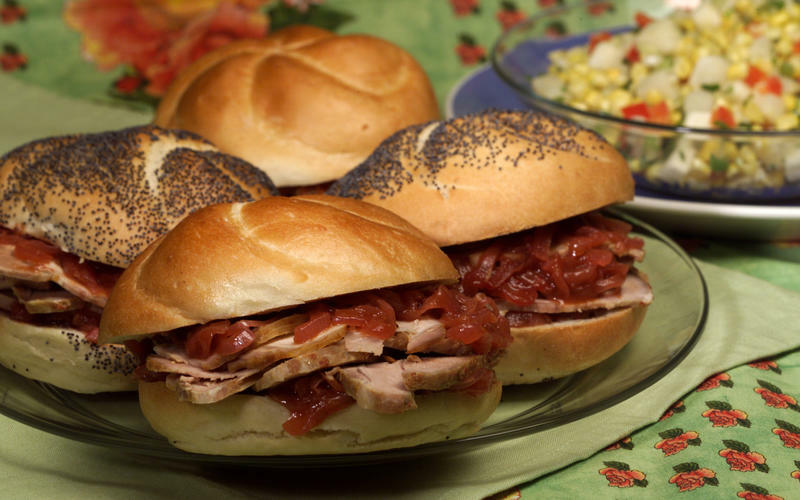 Step 4To serve, smear the insides of the warm buns with about 1/3 cup warm Plum and Onion Ketchup for each, add sliced pork, cut the sandwich in half, place on a platter and serve. In Recipes-list.com we have selected the most viewed recipes from category - Sandwiches . Enjoy the best recipes specially selected for you! Chipotle pork sandwiches is the right choice that will satisfy all your claims.